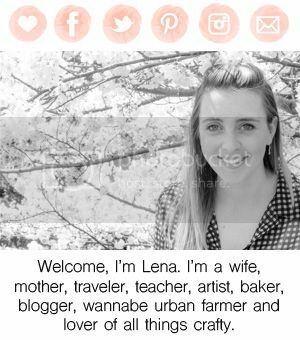 Rootandblossom: Dinner Guests? Supply a Pizza Bar! Dinner Guests? Supply a Pizza Bar! 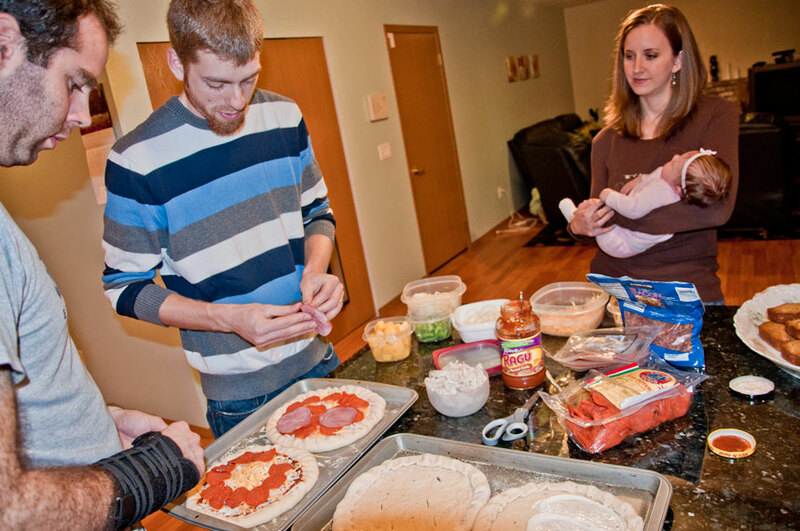 Chris and I knew two things last night: we wanted homemade pizza and hoped to have guests over. We invited Clark and Mikaela's family over (yes, the lovely couple we traveled to Japan with and then lived with for a couple months post earthquake evacuation), but I couldn't settle on toppings. Most people have specific topping combinations they prefer on their pizza, instead of playing a guessing game or defaulting to basic cheese or pepperoni we decided to have a pizza bar! Directions: In a large bowl, dissolved the yeast in water. Add 2 cups of flour, oil, salt, basil, thyme, and sugar: mix together. Begin to gradually add more flour until you form a stiff dough (not too sticky to handle). Knead dough for one minute. * Cover with a towel and place in a warm area to rise till double. 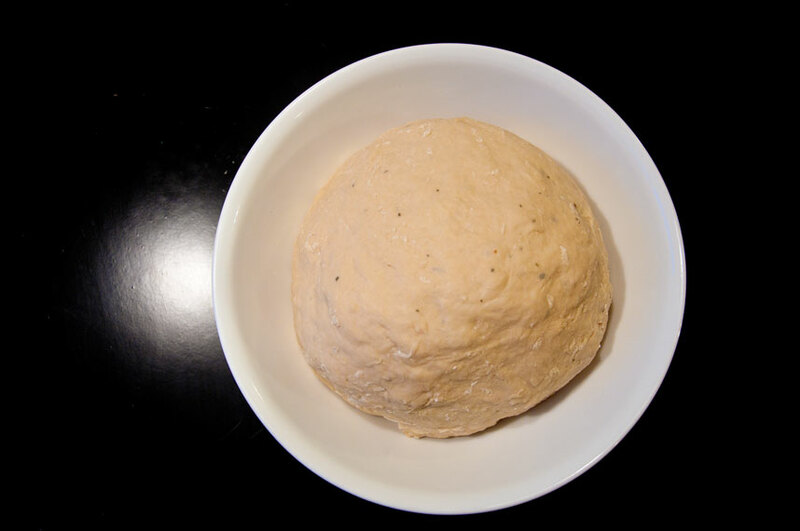 Knead dough down than cover with plastic and place in the refrigerator. You may chill dough over night or at least 30 minutes. 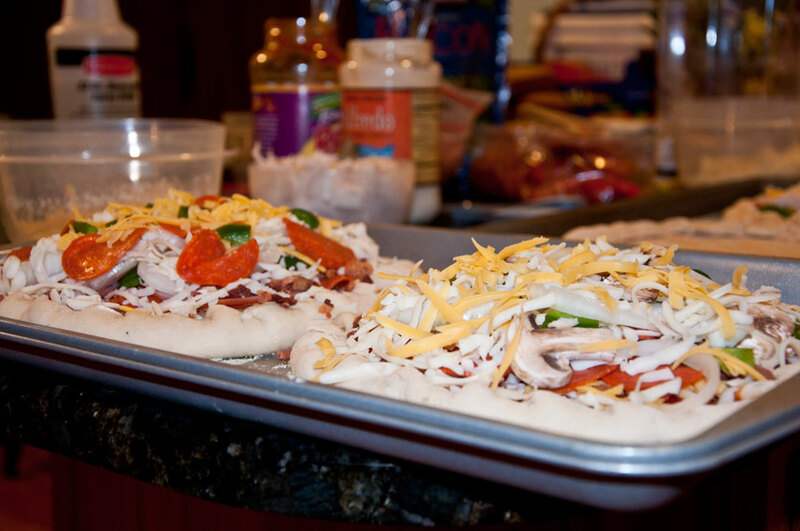 Roll to desired size and roll in edges to form crust. 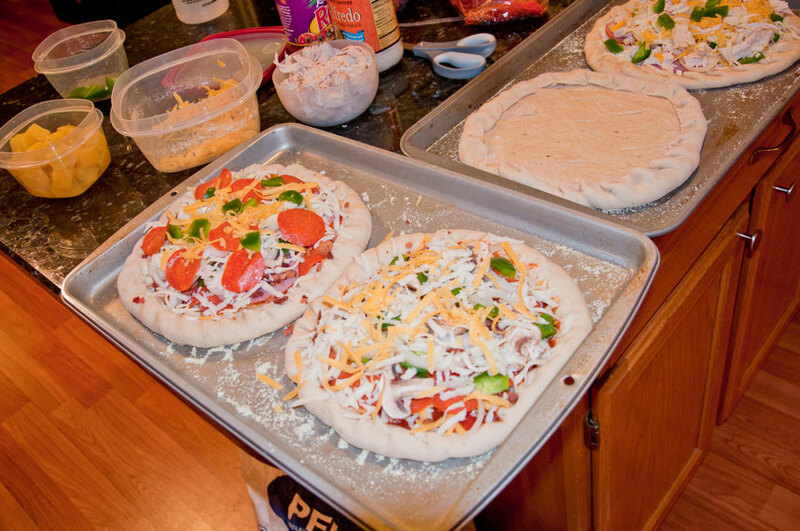 Make several slits in the bottom of the dough by hitting it with a butter knife. Brush dough with a light coat of oil before adding you layer of sauce. Top with your favorites! Yields: 1 pizza. Bake at 375' until crust is golden brown. *This is from the original recipe. Sometimes when I make this dough I make it the night before and then place it immediately in the fridge. 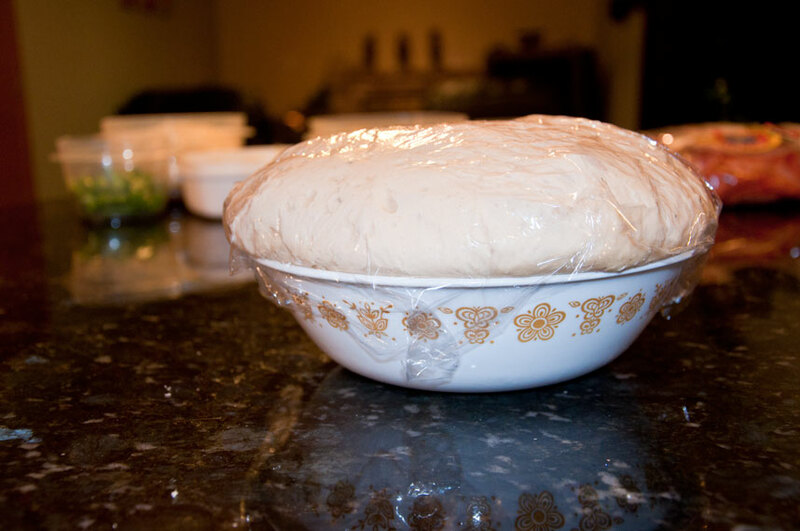 The dough will raise while in the refrigerator, but that is if you make sure it has room to raise in the bowl you cover it in. Once the dough raised I punched it down, sectioned it into found equal chunks, rolled it out, pinched up the crust, placed a few slices in the dough to reduce air bubbles, and placed dough on a cookie sheet sprinkled with cornmeal. 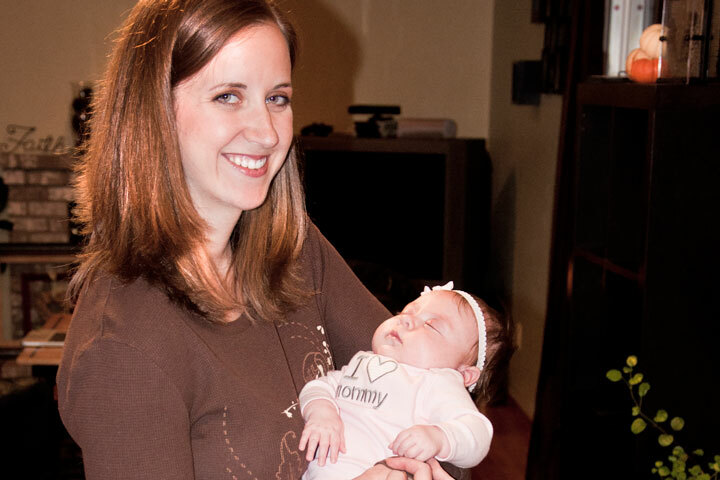 Baby Miley's first visit to our home! 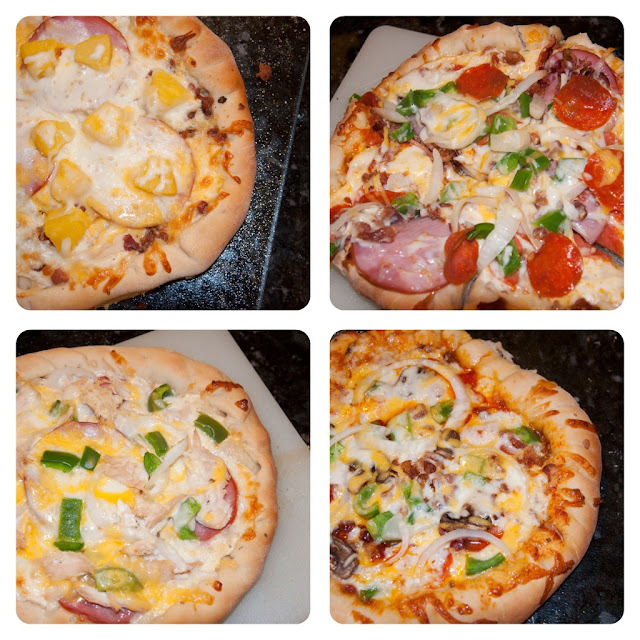 Four separate pizzas, all different, but all wonderfully tasty! This was SO much fun and took a lot of pressure off me as the cook! Great part/hosting activity! What fun hosting dinner nights have you had? Any ideas? !